I've been holding on to this one because you have to be ready to sink into a Meg Rosoff book. None of this wishy-washy, "Oh, that might be nice to pick up tonight." You've got to be all in. Ready to let her work her magic. Interestingly, What I Was was first released in Britain as a YA title, then later in the U.S. by Viking Adult. Not sure why the switch but, as is the case with both her previous novels, I think What I Was will appeal equally to adults and young adults. I, naturally, couldn't put it down. The narrator of this brief, haunting tale remains nameless for the majority of the book. All we know is the year is 1962, the place is England, and the main character is a young man who, having been expelled from two previous boarding schools, is being rather unceremoniously dropped off on the doorstep of his third. Unremarkable in almost every way, the only striking thing about him appears to be his supreme disdain for, well, most everything, a sort of monumental apathy he seems to have absorbed over sixteen years of uninspiring schools, uncaring teachers, and uninvolved parents. "It's time you sorted yourself out," he said. "You're nearly a man." But a less true description could scarcely have been uttered. I was barely managing to get by as a boy. "It was love, of course, though I didn't know it then [...] At last I extinguished the lamp, though according to my watch it was still early. And then, divided from the night by nothing more than four flimsy walls and an idea of a friend, I fell asleep." It's a quiet, beautiful, strange book and I loved it. I absolutely loved, loved, LOVED Meg Rosoff's "How I Live Now". It was amazing and one of those lifechanging novels that you never forget. 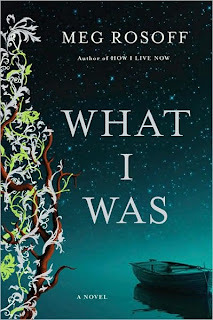 However, I've had "What I Was" on my shelf for awhile, and started in on only the first chapter or so... I'm not sure why, but it's really hard for me to get into this one. I know how you feel about How I Live Now. I read it in a day and then got up the next morning and read it again. What a book. And certainly her "warmest" novel to date. Each of her books seems to be wildly different in tone and, though How I Live Now is definitely my favorite, I really did love Just In Case, albeit in a wholly different way. I guess something about her writing just does it for me. I'm intrigued. I'm going to have to read this one at the end of the summer.